How can I add style rules to give visual feedback in TFS Online regarding untouched working items? I love design and I love visual reports and alarms if something is failing. I do not love text reports though they don’t give much based on real time information and you must read lots of text to say some few things. That’s one of the biggest ideas I love about Kanban boards and the creativity for teams to make it more self-reporting by look at the board. 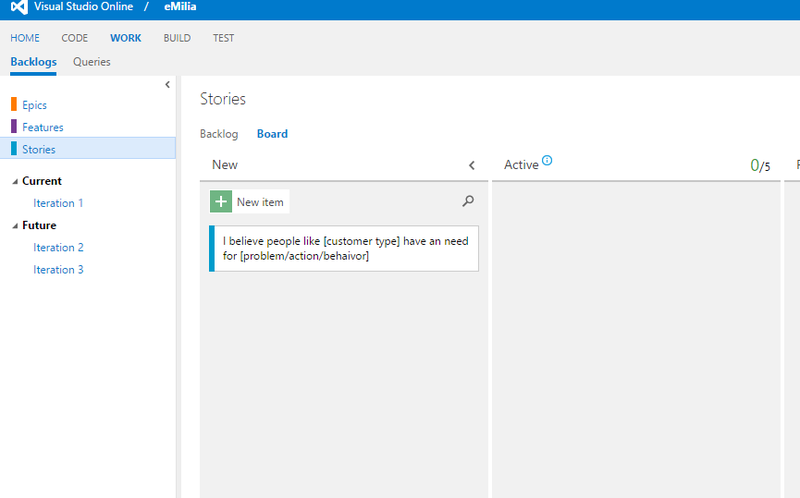 In this blog-post I will give you a tips how you early can indicate if a user story hasn’t been change for a while. Let say you have a velocity of doing x-total user stories a day. Something happens on the way and you want it to be visual for the whole team. Maybe you thought you could handle more user stories than predicted in the sprint? Or in your daily work? Maybe you have spent to many days on a user story without anything happens to it and want to indicate a visual risk? And to indicate this you want the Kanban board to tell you early that you might be in trouble so you can fix the problem early in the iteration. 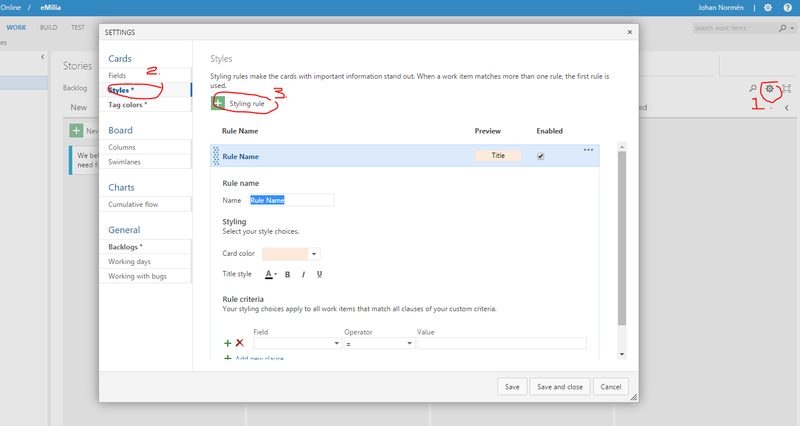 You can simple visual this by adding styling rules in TFS Online that change the color of the User Story or the Task if you want to. I my case I love the idea to indicate a warning if the card hasn’t been processed for a while. First I want to indicate it with orange color that tells me: “Hey, we might be in trouble here, but we are not in the critical state yet! ” And I also want to know if my User Story is in a critical state. “hey, dude this User story takes too long, there is a high risk here! 😛 ”. TFS Online does not have all the feature I wish for when created this blogpost. 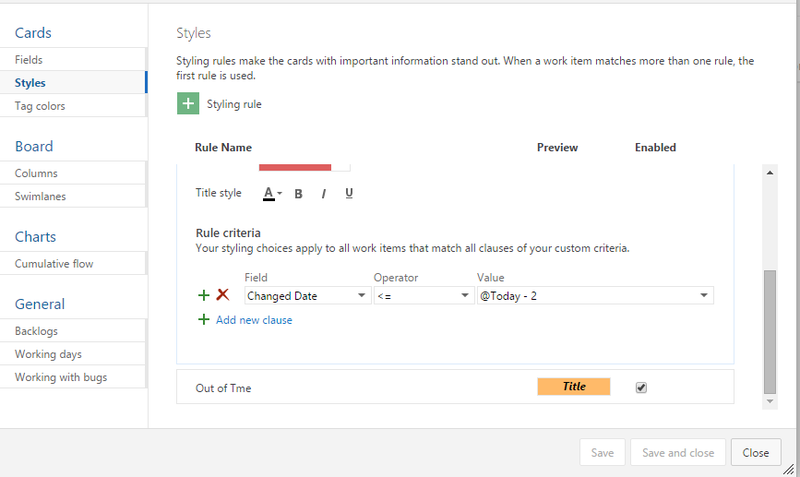 So I will use the “Changed Date” attribute on cards. What I really wanted was some kind of Deadline Attribute. If using #NoEstimate and 1-2days UoW (Unit of Work) approach it could be set to 2 days from the date when you approved it, and start working on that item. Or if using Scrum Model and add estimated times on the tasks you can set the deadline to the time summarized by all the tasks and some extra risk factor if wanted. I used LeanKit before and added deadline to cards that the customer needed to handle before it was in the Definition of Ready State. 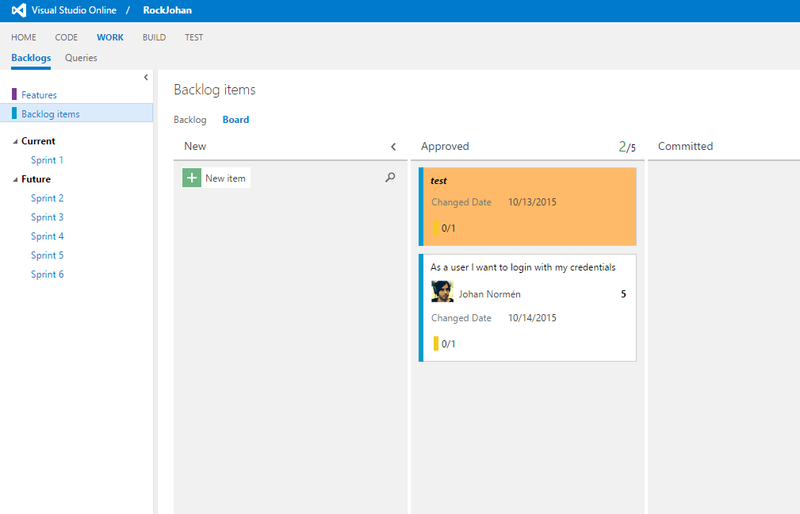 To let them understand that something needs to be done in two days, if not we need to put it back to the backlog. Or a deadline for people that love to compete with them self-regarding their own task in a more “Gamification at work” way. Or if working with other stakeholders like integration partners and need to push them to be done with some tasks before a certain date, though they had not the possibility to go full agile with us. 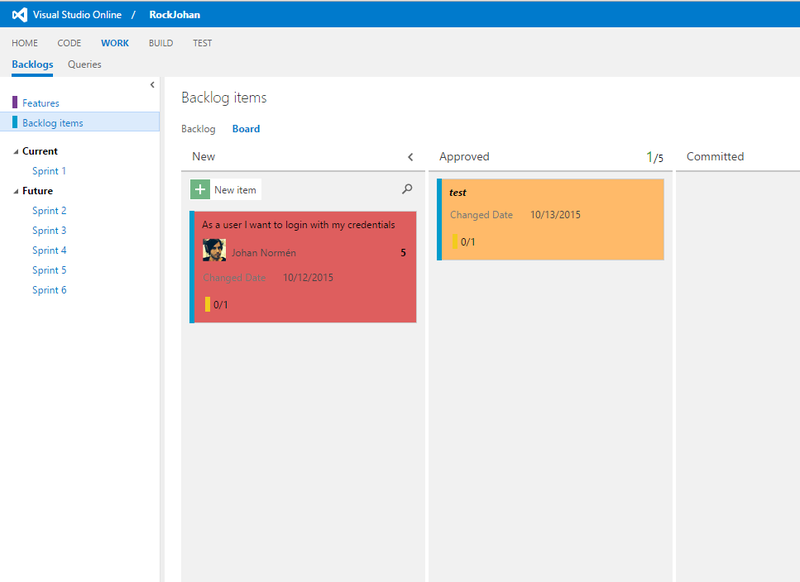 This is how it looks like in LeanKit if the end date is near. It gets yellow. If not, it’s white and over time it’s red. I love those kinds of Visual Elements and LeanKit have many nice features for it. So let’s hope TFS Online soon will have too. To add similar rule, you simply go to the board settings. After that I added two rules. I called them ”to Late” and “Out of Time”. The naming can be something different I just used them for this demonstration. In the Styling rule I used the “Changed date” and @Today syntax. @Today is just the date of the actual day. 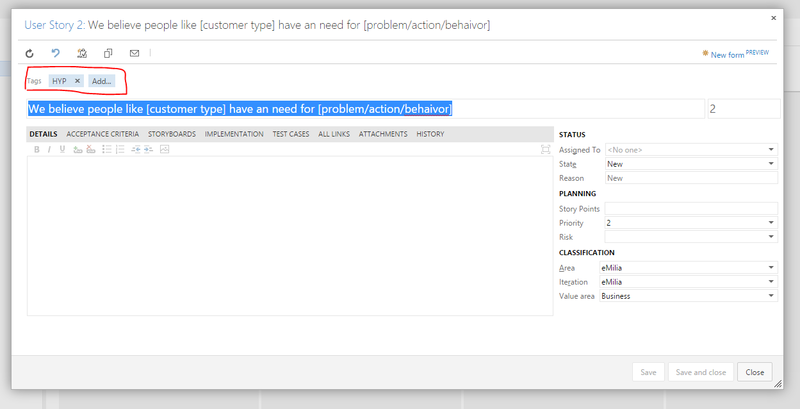 You can use more advanced attributes if using TFS on premise. For the “Out of Time” I added the orange color and wanted to get indication if the item hasn’t changes within a day. The Card will indicate change when it’s moved to different states, when text is changed etc. But sadly it will not trigger changed date if a related task has been changed, and that’s sad though in Scrum projects you mostly work with many tasks for each user story. And it would be nice to indicate on the User Story level if a task has some rules you missed. Eg. You might have forgotten to change the remaining time, and to indicate on the user story level that something is wrong would be a nice feature to let developers know that they have missed this. The remaining time is important for the burn charts etc. And for the “to late” I did the same but red color and -2 days. You can have higher numbers if you like to. I just add -1 and -2 for the demo. And here is how it can look like in action. You got the warnings. One user story is near critical state and the other one is already in critical state. As soon you move the card it will change the date and the result will be normal again. Johan Normén is 37 years old, work as a speaker, mentor, team leader, agile coach, and senior .net developer at Softhouse in Gothenburg Sweden. He has over 18 years business experienced and worked in many different projects and roles. Was one of the creators of Swenug (Sweden .Net User Group) with over 3000 members all over the country. He started the computer era as game designer at the age of 12 with his Amiga and team. He has been nominated two time as the top 100 developers in Sweden in the Swedish version of Computer Sweden. 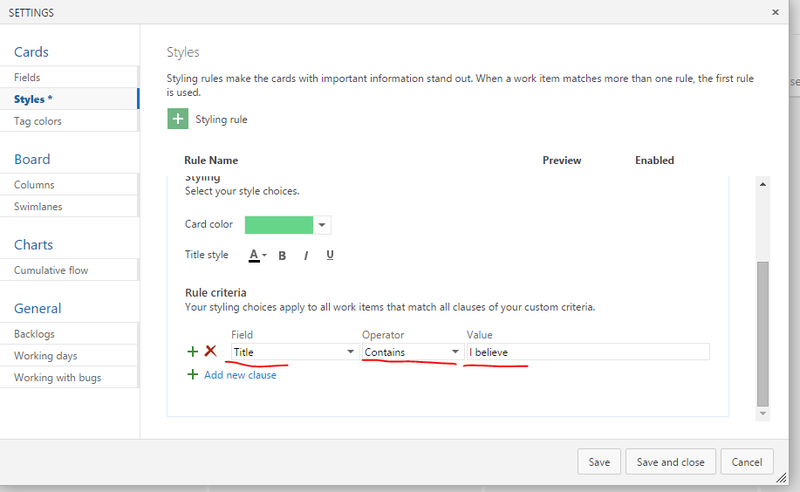 How to color cards in Microsoft TFS Online. Add color to a Lean hypothesis card. I think most of you have heard of Lean Startups and maybe also UX for Lean Startups. Ok if not I will explain it shortly. In Lean startups you use hypothesis that is an assumption when user story is not. Lean Startup strategies are designed to test assumptions about customers and the market target. While User Stories are the description of a technical solution that we can test in our system then Lean hypothesis is a description of an assumption we need to test on the market, the users. I believe [target market] will [do this action / use this solution] for [this reason]. 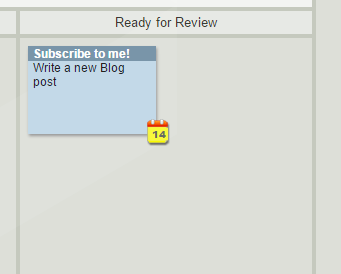 You simple add that description on your card (post-it) or digital Kanban board. I often want different colors on my cards to increase the visualization better. Bugs are red cards, things I need to look up maybe blue cards, user story a yellow card and hypothesis maybe green and so on. I want fast feedback what’s going on when I look at a Kanban board that’s why I add more visualization to it so I don’t need to spend too much time understand what’s going on in this sprint or iteration. 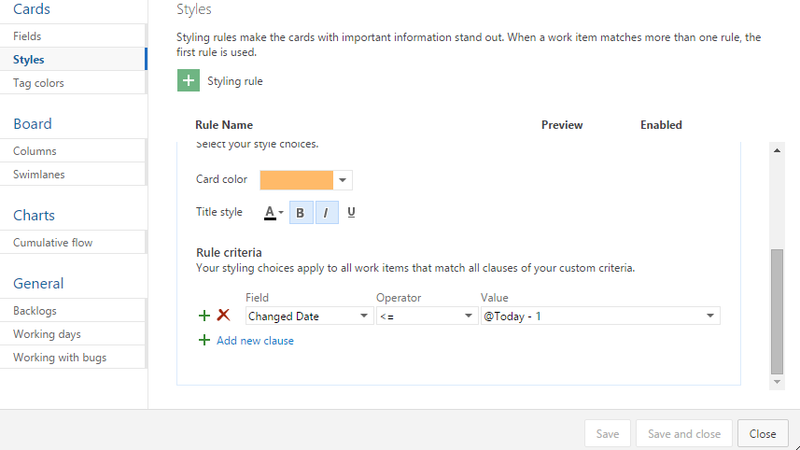 In Microsoft TFS Online you can’t change the color of the cards based on card types when this blog-post is written (2015 Oct 9). But you can change colors on the card based on styling rules in TFS Online. 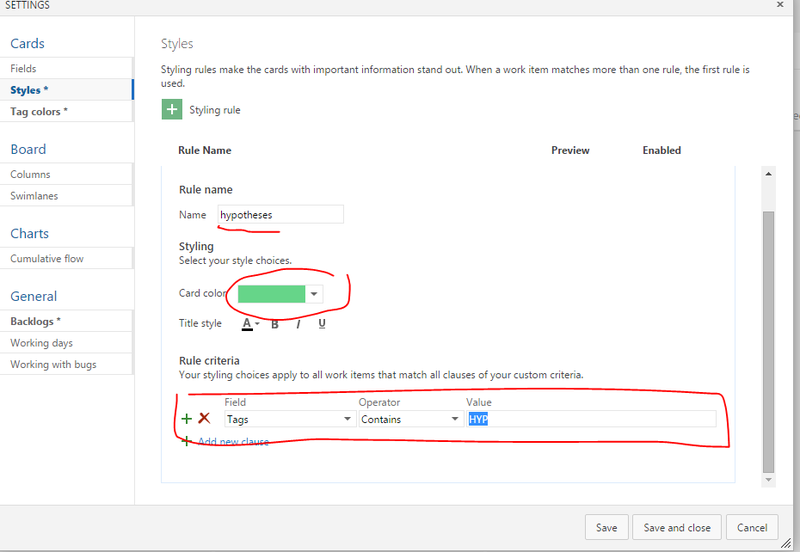 The cool thing with styling rule is that you can add criteria based on mostly anything that exist on a card and make it show up in different colors. In this case I use Tags and the contains criteria in this demo to add another color to my hypothesis cards. I will show you how to do this in TFS Online. First of all open you TFS Online project. Add a card. In this case I added my first hypothesis . Then go to the board settings (The icon in the right corner (1)). 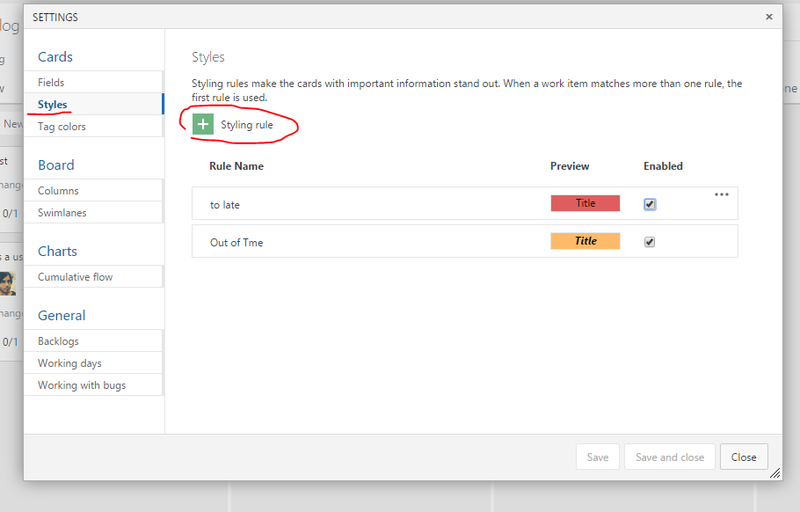 Go to the Style option (2) and add a new rule (3). After that just add your criteria. Remember that you can add many different criteria. In my case I will first add a criteria for a tag. 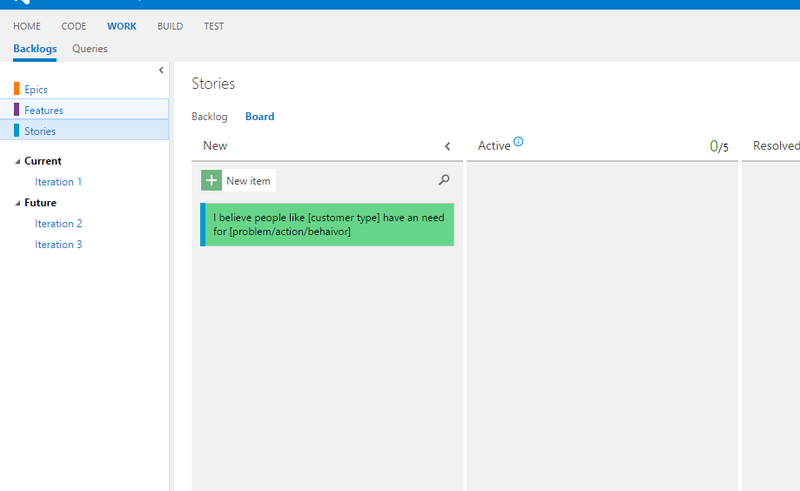 And next add a criteria that check if title contains some words. Like the words “I believe” as the hypothesis template starts with. On the image above I added a rule based on tags. If the tag HYP is added then show green card. Next image show you how it can look like if the criteria contains text in the title . If using Tags make sure you add your tag to the card. If you used the “contains” criteria just save the settings. And the card will end up green on the board. That’s it… Happy playing around.